BAGUIO CITY – Sixteen police non-commissioned, commissioned officers and non-uniformed personnel of the Baguio City Police Office (BCPO) were given the appropriate recognition by regional police and city officials during simple but fitting ceremonies held at the BCPO grounds Wednesday morning. 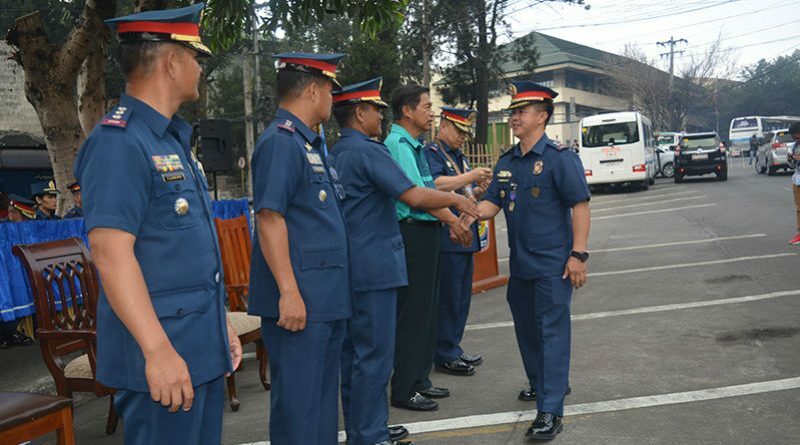 Chief Superintendent Rolando Z. Nana, outgoing regional director of the Police Regional Office – Cordillera (PRO-COR), and Mayor Mauricio G. Domogan handed over to BCPO City Director Senior Superintendent Eliseo T. Tanding the Medalya ng Kasanayan for his significant leadership and supervision of the BCPO in curbing the illegal drug menace and in minimizing the occurrence of crime incidents that resulted to the increase in index crime clearance efficiency of 66.39 percent and index crime solution efficiency of 48.96 percent and the reduction of average monthly index crime rate from 6.49 to 5.80 from June 1, 2018 to January 2019. The Medalya ng Kagalingan was awarded to Superintendent Allan Docyogen, Senior Inspector Francisco Cacas, Jr., SPO1 Frederick Q. Chiday, PO3 Freddie Balaki and PO2 Ryan Quite for the successful services of the warrants of arrest issued by different courts that resulted to the arrest of wanted criminals in the different parts of the city who went hiding in other places in Northern Luzon. On the other hand, the Medalya ng Papuri was given to Superintendent Edward S. Aquintey, SPO2 Selvi A. Codangos, PO3 Eric B. Bainan, PO3 Valiant L. Khayad, Chief Inspector Oliver B. Panabang, Senior Inspector Arnold Y. Lising, SPO1 Elmo A. Luis, SPO1 Geliza M. Moyao, PO3 Solban F. Fangalatan, SPO4 Arlan C. Dumaguing and NUP Defiena S. Bud-oy for the successful implementation of bus bust operations that resulted to the arrest of high value drug criminals, for demonstrating exemplary devotion for their respective tasks during the conduct of the annual Baguio flower festival, for the successful service of warrants of arrest that resulted to the arrest of wanted criminals, for the collective efforts in rendering security services for the safety of the guest of honor and speaker and his party, very important persons, high ranking PNP and AFRP officers and other guests during the celebration of the annual alumni homecoming of the Philippine Military Academy (PMA) and for their selfless dedication and support to the PNP organization in processing the procurement of 16 units mobile vehicles, 28 units motorcycles, 130 units hand held radios, 214 pieces bullet proof vests, 1 ballistic shield, 1 reloading machine and programming the procurement of 89 computer desk tops with printers, 7 laptops, 3 photocopiers, 3 projectors, 3 scanners, 1 Duplo machine, 2 shredders, 45 executive chairs, 110 office tables, 110 office chairs and 13 portable generators. The individual citations were received by the police officers and civilian personnel from the aforesaid police and city officials which formed part of the program that was prepared by the BCPO as a tribute to the retirement of Chief Superintendent Nana. Tanding expressed his gratitude to Mayor Domogan for the all-out support that had been and will be extended by the local government to the implementation of their priority programs and projects geared towards sustaining the gains of their unrelenting and uncompromising peace and order campaign and to Chief Superintendent Nana for his passion and dedication to maintain the decent peace and order situation not only in the city but also the region as a whole.